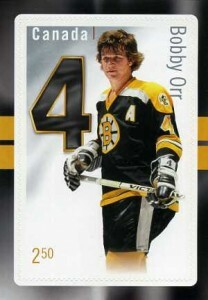 2014 Canada Post NHL Original Six Stamp Sheets technically aren't called hockey cards, but they might as well be. They come in packs, they have the same dimensions as standard cards and there are bios and stats on the back. The commemorative stamp sheets even have a modern chase element with randomly inserted autographs. 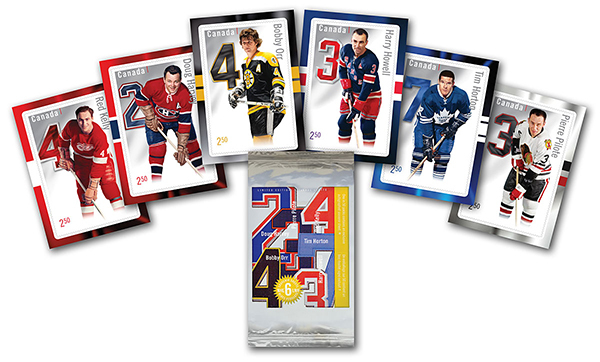 Honoring some of hockey's greatest players from the league's most historic franchises, the 2014 Canada Post NHL Original Six Stamp Sheets set comes like a pack of cards. Every one has a complete set of six sheets. 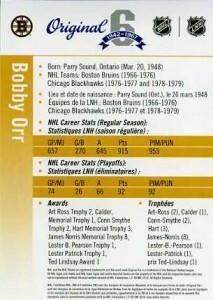 The checklist is headlined by Bobby Orr, Red Kelly and Tim Horton. 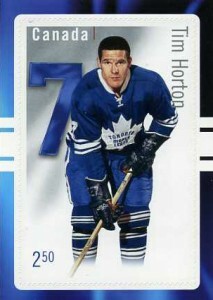 While they look like hockey cards, they really are stamps. Each can be peeled and used for $2.50 worth of postage with Canada Post. Backs have career stats for both the regular season and playoffs. Also included are vitals, a list of the teams they played for and awards. 1:50 packs has an autograph. Orr, Kelly, Harry Howell and Pierre Pilote all signed for the commemorative set. Signed stamp sheets have an added Canada Post hologram sticker on the front to show that they're authentic and not signed afterwards. In addition to the souvenir sheets, Canada Post has created several other collectibles to go with the 2014 Original 6 line. A collector's album (limited to 10,000 copies) includes stamps, a silver plated plaque and an exclusive Upper Deck Bobby Orr card. 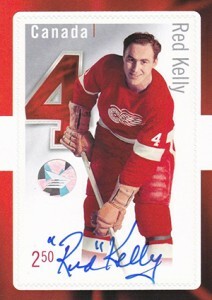 Other Canada Post Collectibles include first day covers and framed displays that also have autographed photos.